Power Research Inc. (PRI) is a manufacturer of industrial grade fuel treatments designed to treat heavy fuel oil, diesel and gasoline. Found- ed in 1985, PRI chemistries incorporate pro- prietary thermal stability technologies that per- mit cleaner combustion, reduced emissions, and prevention of deposits on engine compo- nents and boiler tubes. PRI offers PRI-R, a heavy fuel oil treatment that overcomes operability issues associated with carbon, vanadium, sulfur and sludge. First, PRI-R is a maintenance product. PRI-R has been proven to prevent carbon and vana- date deposits results in extended time between component overhauls, hence providing added value and reliability to our vessel owners, increasing bottom line profitability. PRI-R has also been tested independently and found to reduce smoke opacity, NOx and S02. Sulzer (380 cST fuel oil) provided NOx reduc- tions exceeding 21 percent, with S02 reduc- tions topping 10 percent. Fleet managers who have incorporated the product have reported advantages ranging from double exhaust valve service time between overhauls on medium and slow speed engines, to turbo blades that remain deposit free and waste-heat boilers that are free from soot build-up. 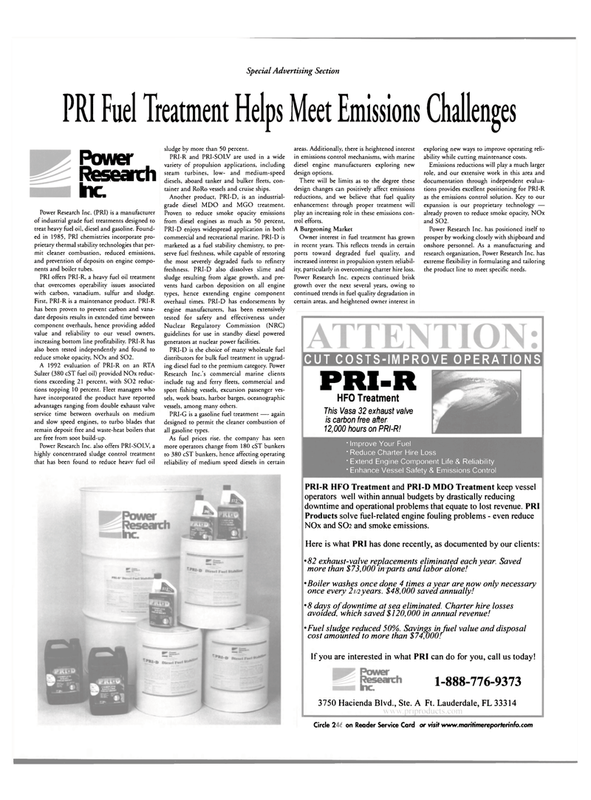 Power Research Inc. also offers PRI-SOLV, a highly concentrated sludge control treatment that has been found to reduce heavy fuel oil sludge by more than 50 percent. PRI-R and PRI-SOLV are used in a wide variety of propulsion applications, including steam turbines, low- and medium-speed diesels, aboard tanker and bulker fleets, con- tainer and RoRo vessels and cruise ships. Another product, PRI-D, is an industrial- grade diesel MDO and MGO treatment. Nuclear Regulatory Commission (NRC) guidelines for use in standby diesel powered generators at nuclear power facilities. Research Inc.'s commercial marine clients include tug and ferry fleets, commercial and sport fishing vessels, excursion passenger ves- sels, work boats, harbor barges, oceanographic vessels, among many others. PRI-G is a gasoline fuel treatment again designed to permit the cleaner combustion of all gasoline types. As fuel prices rise, the company has seen more operators change from 180 cST bunkers to 380 cST bunkers, hence affecting operating reliability of medium speed diesels in certain areas. Additionally, there is heightened interest in emissions control mechanisms, with marine diesel engine manufacturers exploring new design options. There will be limits as to the degree these design changes can positively affect emissions reductions, and we believe that fuel quality enhancement through proper treatment will play an increasing role in these emissions con- trol efforts. Owner interest in fuel treatment has grown in recent years. This reflects trends in certain ports toward degraded fuel quality, and increased interest in propulsion system reliabil- ity, particularly in overcoming charter hire loss. Power Research Inc. expects continued brisk growth over the next several years, owing to continued trends in fuel quality degradation in certain areas, and heightened owner interest in exploring new ways to improve operating reli- ability while cutting maintenance costs. Emissions reductions will play a much larger role, and our extensive work in this area and documentation through independent evalua- tions provides excellent positioning for PRI-R as the emissions control solution. Key to our expansion is our proprietary technology — already proven to reduce smoke opacity, NOx and S02. Power Research Inc. has positioned itself to prosper by working closely with shipboard and onshore personnel. As a manufacturing and research organization, Power Research Inc. has extreme flexibility in formulating and tailoring the product line to meet specific needs. NOx and SO2 and smoke emissions.